Freedman Seating Company and FMS Seating once again look to feature new products with safety, comfort and design at the forefront. This year, BusCon attendees will have multiple areas to view and test Freedman products, including in-vehicle displays. Give passengers the power to charge smartphones, laptops and tablets with USB and 110v electrical outlets. Available on most Freedman seats, including the popular Feather Weight and GO/GO-ES series. The Freedman GO-ES Seat is designed for flexibility to accommodate your passengers growing needs. Designed for easy customization, The GO-ES Seat is shipped “option ready” giving you the flexibility to quickly add accessories in the field. Also see the newly improved GO-ES Foldaway seat. Esquire Seat with Camira Fabric and Vinyl mounted on Ford OEM legs. We gave our engineers two priorities, Safety and Comfort. They gave us the stylish Freedman Esquire seat. Features include height adjustable 3-point shoulder belts, Knee Saver backrests for increased hip-to-knee room, and contoured head rests. The Esquire meets FMVSS 210 and 202A to provide the ultimate combination of safety and comfort for all passengers. See the Esquire mounted on Ford OEM legs! Designed and built for more legroom and comfort with thinner seat back. The GT seat incorporates an internal 3-point seat belt system that adjusts automatically to the passenger´s height. 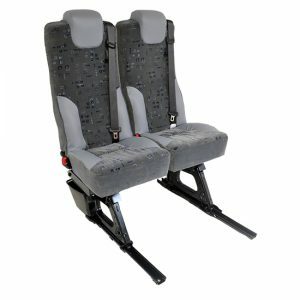 Developed for adults and children with a height of at least 49”; smaller children require a booster seat. This seat includes our well-known ergonomic design provided in all the Amaya-Astron seat models. CitiPro 3PT with new Synergy fabric. 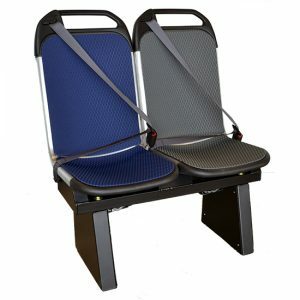 Ideal for small and mid-size buses and vans, the CitiPro 3PT by Freedman Seating combines comfort, style and safety! European styling, ergonomic design, and 3-point belts make the CitiPro 3PT a seat passengers want to sit in. Engineered to enhance your vehicle’s design with maximum comfort and safety. The G2ELPQR driver seats are ergonomically designed to help reduce day to day driver fatigue and stress. The structural integrity built into each seat greatly dampens erratic movements caused by varying road surfaces. USSC’s G2ELPQR seat with P1M mechanical suspension integrates the best in seat ergonomics and suspension integrity that greatly dampens erratic movements caused by varying road surfaces. Carbon Fiber Italia Armrest on Napoli Seat. New Italia and Messina coach style armrests! New armrests feature a coach-style design to accentuate your executive seats by FMS and Freedman Seating. 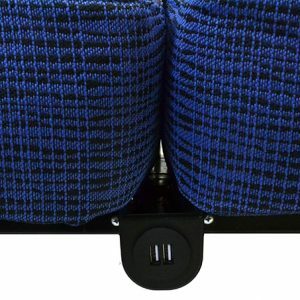 The matching Messina armrest is perfect for in between seats or against the vehicle wall. Both armrests are available in wood grain, carbon fiber, and solid black or gray. Experience the utmost in luxury, comfort, and style. The Trieste seat is available with several different insert styles and upholstery materials, allowing you to customize the look that best fits your needs. Designed to fit the needs of the executive shuttle market, the Bellagio is available with both rigid and reclining backs, in a variety of seat widths and insert panel styles. Deep bolsters hug you into the seat, providing the ultimate in passenger comfort. Let all customers experience the look and feel of first class with the Bellagio. Venezia seat with CMI Hamilton vinyl. The newest edition to the popular Eleganza Collection by FMS. The Venezia seat combines comfort, style and safety with deep side bolsters, contrast stitching, and a 3-point seat belt. The Palermo seat serves your economical needs without compromising style or comfort. 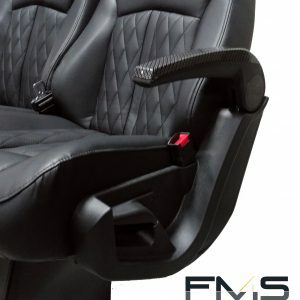 The executive line by FMS includes the market’s most complete seating solutions with luxury and safety at the forefront of its design and engineering. Experience the latest in executive seating by FMS. Available in both rigid and reclining backrests, the Napoli comes standard with adjustable headrests, Eleganza leatherette vinyls, and optional contrasting style lines. Sporty, stylish, and luxurious, The Napoli provides maximum comfort to all passengers. 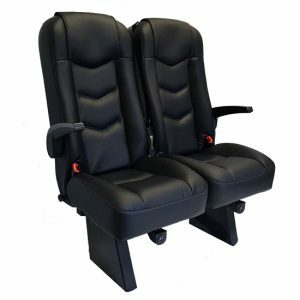 Available in both rigid and reclining hi-backrests with subtle bolsters and a built-in headrest for added comfort. A unique pattern with the option of contrast stitching makes this seat the perfect addition to our Eleganza Collection. At BusCon, attendees not only see more buses in all shapes and sizes than any other venue, but also the latest vehicles from manufacturers, officials from various associations, companies and their latest technologies. It’s the largest bus show in North America. Get a chance to see the latest equipment and products on the market. Talk to officials directly to learn how it works, discuss with peers to see how vehicles and technologies are working. Anyone who is involved with buses including public transit and paratransit, owners and operators of private companies that provides charter, tour, corporate, car rental, high-end, intercity, senior or casino transportation, or plan and/or coordinate university transit, BusCon is where you need to be. Whether you are looking to purchase a vehicle or technology that will help increase vehicle or operational efficiencies, looking to enrich your career through education, or just getting out to network with your peers who are also doing what they can to help their operations thrive in today’s economy, BusCon will give you the tools you need to professionally refresh and revitalize the way you tackle your business. What will I learn at BusCon? BusCon is all about technology. You’ll learn about the latest in alternative fuels and other green technologies; telematics; buses, motorcoaches, vans, shuttles and other vehicles; safety; accessible transportation; regulatory issues; training and more.